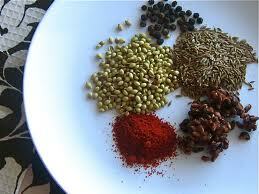 First, dry roast the spices in a dry pan on medium heat until you start to smell their aromas, 5-7 minutes. Cool them for a minute and then transfer to a spice mill or coffee grinder and pulse until they all combine into a uniform mixture. Set aside. Heat a medium-sized saute pan with a nice coating of olive oil on medium heat. When the oil comes to temperature, add the shallots and allow them to caramelize, about 5-7 minutes. Add in the garlic and cook for 1-2 minutes. Toss in the eggplant and pomegranate molasses and allow the eggplant to caramelize as well. After 5 minutes of cooking, add the spice mixture. Let the eggplant cook down further, until it is completely cooked through, about another 15-20 minutes. Once the eggplant is cooked, allow it to cool for 15 minutes. Next, take out a blender/food processor (if you don’t have one you can mash by hand) and add in the cooked eggplant, feta, lemon juice, parsley, mint, a good drizzle of olive oil and blend until combined. Taste to see if any additional salt and pepper is required. Garnish with the fresh pomegranate seeds, toasted pine nuts, parsley, mint, and a drizzle of olive oil. Serve with toasted pita wedges or any flat bread of your choice. It can be served lightly warm or at room temperature, but it can be served chilled.